Some people don’t know the delights of panettone and pandoro, Italian Christmas breads that are now in stores nationwide from. In Italy they’re Christmas and New Year’s staples, given as holiday gifts. Some Americans have adopted the tradition. For years we had friends who’d receive them as gifts, then put them aside like so much fruitcake. We started a Panettone Rescue Mission, to take those panettones and return them as bread pudding or another dessert. They’re delicious simply sliced and served with a cup of coffee or tea. But they adapt well to popular recipes. Pandoro, from Verona, an “Italian pound cake” made in an eight-pointed star shape, topped with icing or confectioners’ sugar. It is often flavored with lemon zest, although anisette and other flavors can be used. 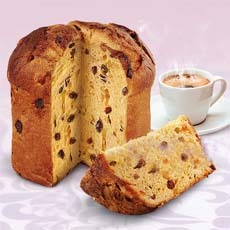 Panettone, a Milanese specialty, a tall yeast bread packed with candied fruits and raisins. Today there are also chocolate chip versions. Panforte is short and dense. While the origins of a sweet leavened bread date back to Roman times, this dense mixture of almonds and candied fruit, sweetened with honey and flavored with spices, was born in 12th century Siena. Think of it as Italian fruitcake. 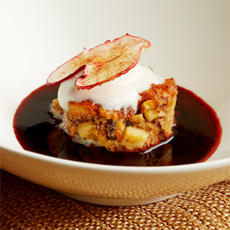 While a plain slice is delicious as is, pandoro and panettone can be turned into more complex dishes. Bauli, the major exporter to the U.S. of pandoro and panettone, has developed numerous recipes. If you want to bake your own, there are plenty of recipes online. TOP: A panettone yeast loaf or cake. BOTTOM: Panettone sliced into a shortcake. Photos courtesy Bauli. You can use pandoro and panforte interchangeably in recipes, but they are different in texture and flavor. Here are some recipes from Bauli along with some of our own favorite uses. During the Renaissance, different European countries and regions within them created their own specialty holiday breads. When the bread was sweetened, the terms “bread” and “cake” were used interchangeably. All are delicious with chai or other spiced tea like Constant Comment; or with a conventional black tea. If you want to put some spirit into your snack, dessert or tea time, serve the Christmas bread with mulled wine (warm spiced wine) or with a sweet dessert wine, such as Spumante or Moscato. 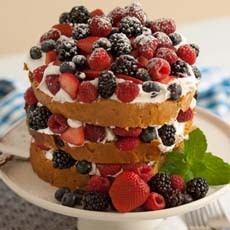 Gingerbread may be the best known Christmas “bread” in the U.S.; it originated in 15th-century Germany. 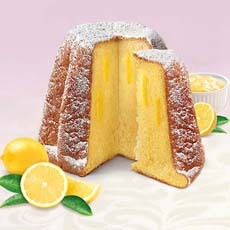 Pandoro is a star-shaped yeast bread sprinkled with confectioners’ sugar, created in 19th-century Verona. Panettone is a Milanese Christmas yeast bread, filled with candied fruits and raisins, that dates to medieval Italy. It is tall, dome-shaped and airy. Stollen is the traditional German Christmas cake or “bread,” created outside of Dresden, Germany in 1437 (not in Dresden itself, a point of historic contention). It is so prized that the city has trademarked the name, Dresden Stollen. The oval shape, covered with powdered sugar, is said to represent the diaper of Baby Jesus! Here are more Christmas breads, with beautiful photos.